Janice H2O Color: M-"My son Andy takes beautiful nature photos!" Andy enjoys hiking and biking and taking pictures. He posts many of his pictures on his blog www.rusticfences.blogspot.com Check them out-I think you'll be impressed! I interpreted one of his photographs in watercolor. As so often happens, I overworked parts of it, but overall, I'm happy with the results. I think I'll try it again-maybe much larger, and use a large brush, which might help me to keep it fresh. 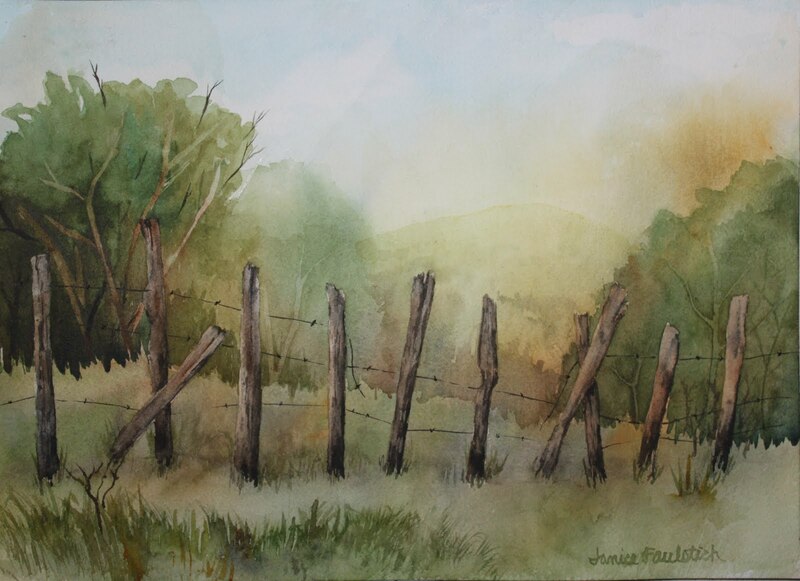 After brushing on a light wash of raw sienna in the area of the fence posts, I masked them, then went back in and painted them at the end. The size is 10" x 14". Janice, This has a nice soft, serene look. Really like the fence. Andy should be pleased.